After two easy days, I was excited to head off again. It was weird to leave James at the hotel and be on my own. 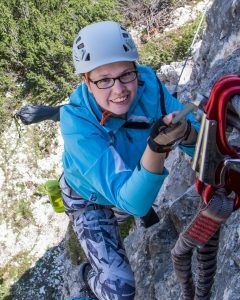 I passed through San Vito di Cadore and then entered the woods. At first, I walked moderately uphill on a wide, sandy track. 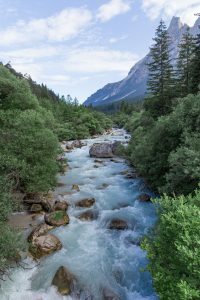 When I took a turn and crossed a river, the path suddenly became a lot steeper. The air was humid and heavy to breath, and mosquitos were biting me as I slowly tackled the incline. As I walked on, the noises of the valley were swallowed by the forest surrounding me. After crossing this river, the path became very steep. Some time later, I took a turn, crossed over a little stream and then headed up an equally steep slope as before. With a lot of smaller tracks for forest work branching off and little signposting, it sometimes took me a few minutes to figure out which way was mine. The only sounds around were the little stream I had been following since the crossing and my own breath. When the path became a lot narrower and started to wind up through the forest along rocks, I enjoyed the hike a lot more. I finally felt fully comfortable being on my own. It was nice just to daydream away while enjoying the beautiful nature and peaceful silence. Every now and then I caught a glance at the surrounding mountains through the trees. After scrambling up some rocks, I passed over this beautiful meadow. For a while, the path was rather even, before it got steep again. From that point on, I had to stop daydreaming and pay attention to navigation. The path was not well trodden anymore, in fact it could hardly be called a path at all. The red and white markings, usually painted onto trees, were rubbed off in many places or just missing altogether. I always had map and compass on hand and was carefully peering through the forest for the next marking. For a second, I worried. What if I lost my way? I pulled myself together and focussed. I would not loose my way, I knew how to navigate. Sometimes it felt like ages until I saw the next marking, but I always found the next one. 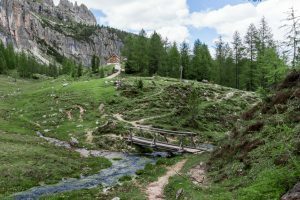 During the last stretch, I could already see the Rifugio Croda da Lago in the distance. The way lead across a rich green patch of grass. A bunch of cows was grazing there, the sounds of the bells around their necks echoing through the forest. After that, I had to cross to more rivers along the way. Both of them were fairly wide and without a bridge or something similar. Luckily, they weren’t particularly deep, so I got away with quickly wading through them. Once again, I found myself hiking and scrambling over some rocks, before I reached another meadow. I was at 2000m above sea level. Bees were humming all around. There were no cows around, but fresh hoof prints made the hike very muddy nevertheless. 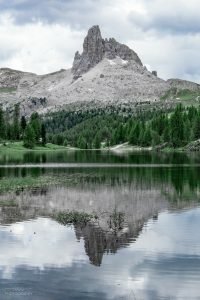 The smooth surface of Lago di Federa beatifully reflected a lonely peak in the distance. After having successfully managed to find my way across, I only had to pass through a final stretch of forest, before reaching the last meadow for the day. 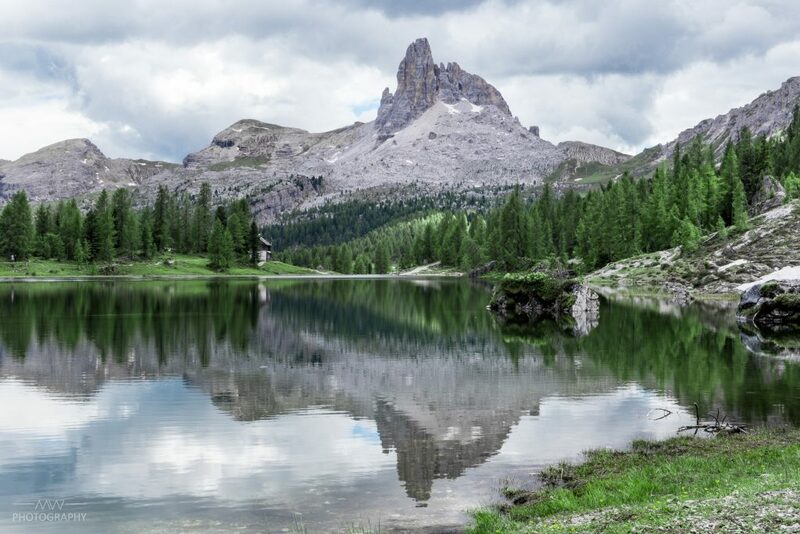 A few hundred metres in the distance, I saw the Rifugio Croda da Lago. While passing over to the hut, I took in the views. In the distance, snow-capped peaks were rising into the sky. A small stream cut through the meadow. I dumped most of my stuff on my bunk bed and headed off again. 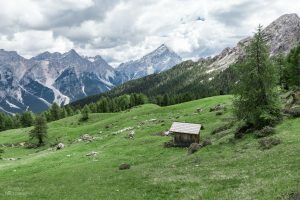 The rifugio was situated right at the little Lago di Federa, so I set out to walk around it. I took my time and enjoyed the views. Rocks with trees on them formed little islands in the lake. On the other side of the lake, a group of peaks was rising high up. Down at the shore, there were some patches of snow. With hardly any wind, the smooth surface of the waters beautifully reflected the surroundings. In the icecold water, hundred of little fish were crowding together in a swarm. A beautiful sunset brought the day to an end. In the direction I had come from, a single peak was towering over the meadow I had crossed last. Looking around, I felt accomplished. I had managed to navigate through the forest on my own. Being out of the valley and up in the mountains again felt good. There is something about the mountains that always seems to make everything else seem small. 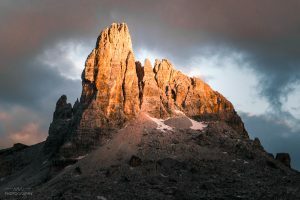 I was just happy looking around, while treating myself to a lovely piece of Linzer torte and a cappuccino at the rifugio. Later in the evening, after another fantastic 3 course meal, a spectacular sunset brought the day to a close. All the surrounding mountains were glowing red in the evening sun, before the light faded into darkness.